As well as the latest cricket news from the BBC Sport website, you can now get the latest scores on your mobile phone or PDA. BBC Sport will not charge you for the use of our mobile services, but your operator may charge you for the data you download. Click here for more on costs. The best way to stay in touch and access all of BBC Sport's mobile cricket content is to text the word 'cricket' to 81010 and then click on the link we send you. For the first time, BBC Sport is also offering live cricket scores. To keep up-to-date with all the action simply click on the results/fixtures link on our mobile cricket site. 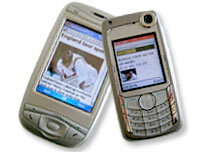 The huge variety of tariffs means we are unable to be specific on the related costs of using our mobile services. While many people now have data usage built directly into their monthly payment plans, others on older plans do not. Please contact your operator for further details on data usage costs.